Täällä siivoillaan myös kuvatiedostoja. Löysin syksyllä tekemiäni kortteja, joita en ole vielä julkaissut, tässä taas tuo ihana keiju. Hi! Two fairy cards to start the new week, my favourite fairy stamp. 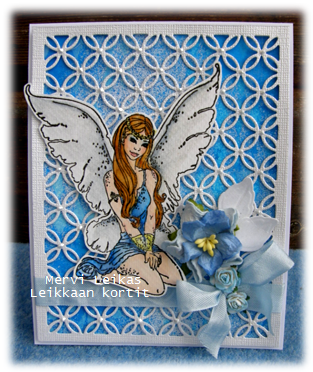 She is such a pretty fairy Mervi and looks lovely against that pretty die cut frame background. Thanks so much for joining us again at Stamping Sensations challenge. Todella kauniita kortteja. Ihana tausta. Beautiful card & fabulous coloring on your gorgeous fairy! Love that gorgeous background die as well! Thanks for joining us this week for the QKR Stampede weekly challenge! Oh I remember this background die, it's been a while since I last saw it, it's beautiful! And I love your fairy. Normally I would vote for blue as my favorite for a feminine design such as this, but lately pink has grown on me, so I'm not sure now. They're both beautiful! Beautiful fairy, Mervi, and both cards are gorgeous! 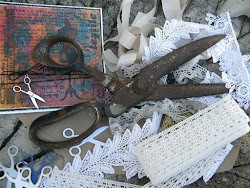 Thanks for sharing them with us at Stamping Sensations.